Once called "the most dangerous woman in America," Mary Mallon — or “Typhoid Mary” — was also the subject of one of the most unusual legal debates of the 20th Century. She was born in Ireland in 1869, emigrated to the United States as a teenager and became a cook in the homes of several wealthy New York and Connecticut families. Around the turn of the century, she contracted typhoid fever, but having suffered only flu-like symptoms, probably didn't know it. However, her body became a carrier of the disease bacterium. In 1906, while working for a banker's family, six of 11 people living in the household came down with typhoid fever. The banker hired an investigator who eventually identified Miss Mallon and found 22 other cases of typhoid fever in families where she worked. New York City health officials took Mary Mallon into custody in 1907 and, without any charges or trial, kept her in an isolation cottage on North Brother Island in New York Harbor. The Press then cited a New York newspaper story that reported that Miss Mallon had appealed to the U.S. Supreme Court for release, saying she’d done nothing wrong and had been illegally jailed without trial. While she was denied release in 1909, she was freed a year later after swearing she would not cook again. 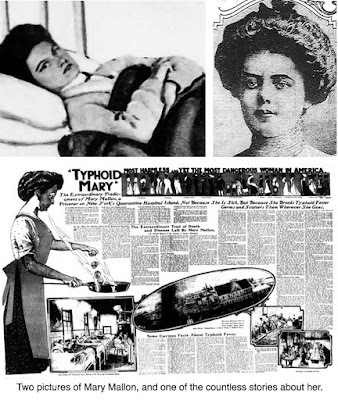 However, in 1915, an investigator tracing typhoid outbreaks at a New Jersey sanatorium and a New York maternity hospital found that Mary Mallon, using aliases to escape detection, had worked in both places. She was apprehended and returned to North Brother Island for the rest of her life, dying in 1938 but always maintaining she was not a carrier. Health officials linked 51 cases of typhoid — including three deaths — to her. The details of the Ridgefield cases are unknown — many issues of The Press from the era when she was here are no longer extant and it's not known how much — if any — news coverage was given to the outbreak here.